Gutters and downpipes are often overlooked in the home maintenance schedule – Yet they are one of the most important components due to the large volume of water that falls on the average Australian roof. Neglecting them means running the risk of major damage through leaks caused by blocked or damaged guttering and downpipes. Tired of the constant leaks, noise and concern over damage to your property? Gutter leaks are bearable at first, but when left unmanaged can lead to severe interior leaks and roof damage. If your home has fallen victim to heavy storms and rainfall, we can offer emergency gutter repair service to fix up the roof as soon as possible. Because guttering and downpipes are constantly exposed to the elements, the conditions of your gutters weaken over time. If you identify a weak or rusted spot, it’s normally an indication that it’s time for your gutter repair – Though in many cases, a replacement is the more cost-effective solution. We pride ourselves on superior workmanship and use only the highest quality materials for our guttering, downpipes, and fascia products. 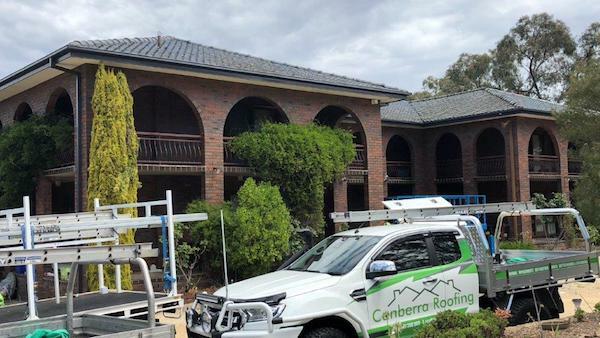 Canberra Roofing’s gutters and downpipes not only look great, they also give your home added roofing protection by carrying rainwater to the ground.